It was about time for Rogier to finish that explanation he started back in chapter… 3? Ok! So, you may have noticed the sidebars look a bit different! 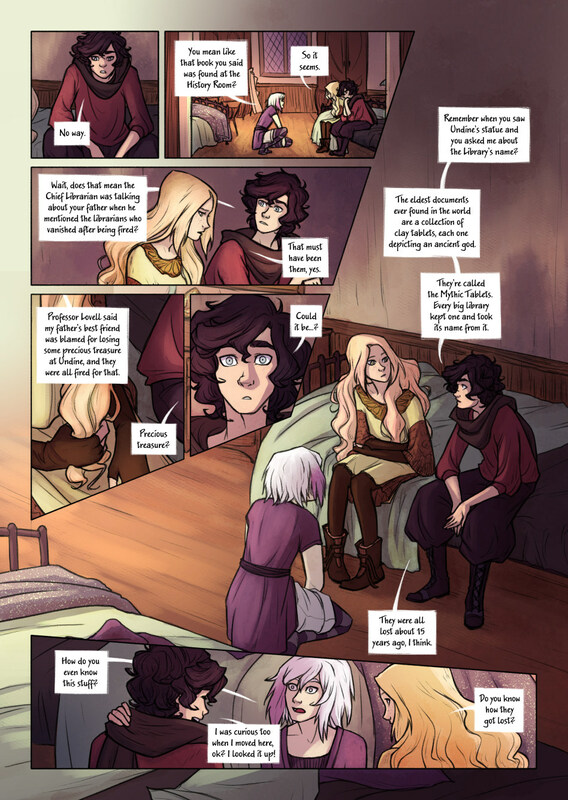 You should also be able to see a new page in the menu at the top of the site, for Extras : D Inside it, you can find any content about Bookwyrms which is not the actual comic (including fanarts!). But let’s talk about the reason for all this: Bookwyrms’ first anniversary this Saturday. I can’t believe it’s been a year already! A year of hard work, but very rewarding and full of artistic growth. I’ve met amazing people thanks to this comic, and the feedback from readers has been very encouraging. I’m very grateful for this experience, so thank you all! I’d like to take this opportunity to spread the word about the comic, so I’ll be releasing a new Bookwyrms wallpaper this Saturday 26th and will share posts about it on twitter, facebook and tumblr. I’ll be deeply grateful to anyone sharing those posts, and I will choose one of you randomly to be in the comic as a character! You will get a sketch of yourself designed as a Bookwyrms character, and you will be able to choose between being a background character or having a few lines with the main characters. If you want to participate in this draw, just make sure you reply to the post as well as share it in any of those social media. – Participate from facebook by sharing the post about the 1Year Wallpaper and replying to it with your favourite character. – Participate from twitter by retweeting the tweet about the 1Year Wallpaper and replying to it with your favourite character. – Participate from tumblr by reblogging the post about the 1Year Wallpaper and replying to it with your favourite character. – You can participate in several of those to get additional chances. – The deadline to take part in the draw will be Tuesday 29th at 5pm GMT. After that, I’ll add all names to random.org (or similar website) and will announce the winner either that day or the following. Thank you all again for your ongoing support and interest in Bookwyrms! Thank you so much! 😀 And yes, trust Rogier to be a complete nerd about anything he finds curious, haha!